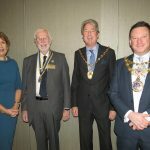 The Rotary Club of Warwick welcomed Cllr Stephen Cross, Chair of Warwick District Council, Cllr Richard Eddy, Mayor of Warwick, and Jayne Topham, Warwick Town Clerk, to their meeting on November 21st for the annual Civic Lunch. After lunch Cllr Stephen Cross said that his aspirations for his role as Chair of the District Council were to “make a difference” to the people of Warwick, to be non-political and to act as the “conscience” of the Council. During his time as Chairman the impact of new developments around Warwick have been one of the Council’s key concerns as a 10year programme of development gets under way. Cllr Richard Eddy, Mayor of Warwick, explained his background in the computer game industry and how important this is to the local economy. His charities for the year will focus on Warwick’s Heritage; restoring it’s wonderful old buildings; supporting the Community with improvements to community buildings; and People with support to local charities such as Safeline. He thanked the club for organising events for the town such as the Thai festival, Town Bonfire, Carols and Pancake races helping to make Warwick a good place to live, a good place to work, and great to visit. President David Smith referred to the close co-operation between the District and Town Council’s in providing support to our events. He thanked the guests for their work on behalf of the town and wished them well for the remainder of their busy year in office. Picture shows left to right: Jayne Topham, Town Clerk, Rotary President David Smith, Cllr Stephen Cross, Chair WDC; Cllr Richard Eddy, Warwick Mayor.